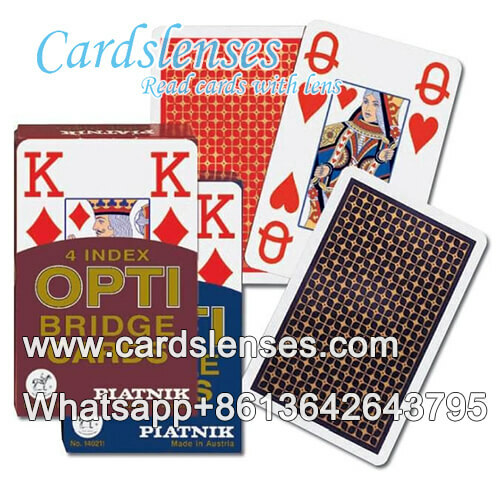 Piatnik brand is made in Austria and OPTI bridge size 4 index poker cards is one kind of Piatnik poker cards, it is also a kind of playing cards with bridge size 4 jumbo index. The backside graphics are regular little squares, colors of blue and red are available. Piatnik OPTI bridge size 4 index marked cards are the cards marked with invisible ink on the back, and those marks can be seen only when wearing our infrared contact lenses. What is more, please remenber to buy our infrared contact lenses when you buy our marked cards, for invisible marks we made on Piatnik OPTI bridge size 4 index cards can not be seen by naked eyes or other contact lenses.